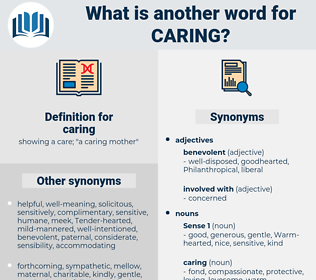 What is another word for caring? 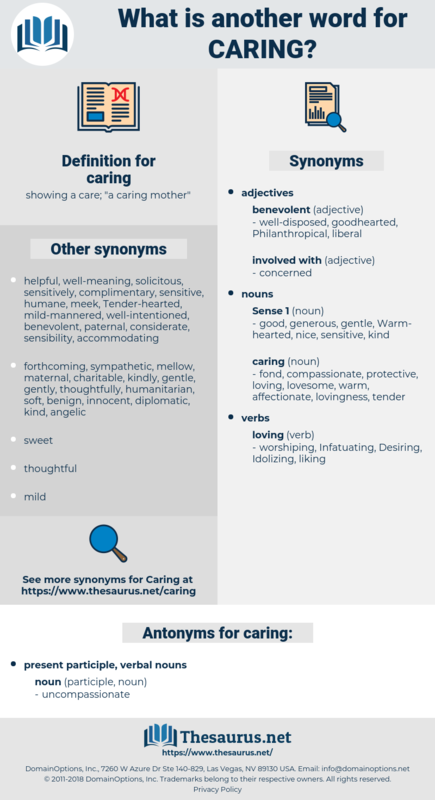 showing a care; " a caring mother"
benevolent, care-giving, Kind-hearted, protective, responsive, vigilant, solidarity-based, caregiving. care-giving, altruism, selflessness, sympathy, caregiving, upbringing. addressed, handled, Worked, Dealt, engaged. Treating, Securing, Guaranteeing, Sheltering, Rescuing, assuring, Addressing, embracing, co-sponsoring, wellbeing, agreeing, approaching, Bothering, Educating, Receiving, Encumbering, Acceding, Responding, supervising, accepting, respect, Respecting, Checking, representing, tracking, saving, Managing, preserving, leaving, Overseeing, covering, guarding, focusing, tackling, supporting, Delivering, Favouring, Assisting, benefiting, helping, greeting, Minding, Aiding, remaining, watching, monitoring, undertaking, striving, Maintaining, conserving, honouring, performing, Sustaining, Discharging, attending, working, follow-up, coping, worrying, touching, targeting, Providing, Inhabiting, Occupying, abiding, Employing, supplying, Admitting, seeing, processing, upholding, assuming, complying, dealing, engaging, Granting, satisfying, holding, hearing, bringing, conducting, inviting, Noting, tending, Allowing, Fulfilling, serving, filling, bursting, Hosting, meeting, taking, Having, looking, Doing, Nurturing, loving, upbringing. Nurturing, affectionate, thoughtful, sympathetic, empathetic, compassionate, empathy, generous, loving, Solidary, supportive. compassion, Nurturing, compassionate, nurturance, solicitude, empathy, affection, benevolence, loving, kindness. Why, then, was she not at this moment in bed, with Genevieve caring for her? Evidently he was not caring for a dead man.